The roseate spoonbill is one of my favorite birds and a common sight around the mangrove of Pine Island Sound and Matlacha Pass. I spotted this pair on McArdle Island which is just two miles south of the drawbridge. It was overcast this morning and the light was poor so the photos don't do the colors of these birds justice. They're an incredibly vibrant pink and scarlet when the sun hits them directly. And no, they're not related to flamingos which we rarely ever see around this part of Florida. No reason for this photo other than I love dogs and I love my boat. That's Maggie, our Puerto Rican greyhound on the right, and her boyfriend Gizmo, a catahoula/beagle on the left. I took this shot last Saturday on the shell beach outside of Jug Creek at the north tip of Pine Island. Great spot for hanging out and letting the dogs run. E-mail me if you want the GPS numbers. Here is and excellent NOAA animation showing the daily progress of the surface oil from the Deepwater Horizon as tracked by several satellites. It shows the entire Gulf of Mexico and state of Florida. In case you're not familiar with our geographic location, Pine Island is 140 miles south of Tampa. On the map in the animation we're the smaller bay located half an inch under the word Tampa. As this animation shows, the spread of oil has come nowhere near us and according to nearly every estimate it never will. 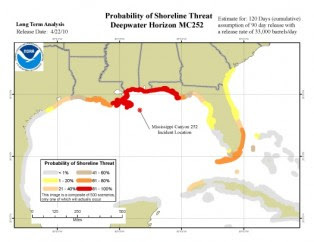 According to NOAA itself there is a less than 1% chance that oil will physically affect Southwest Florida. You can read about it in this CBS news article, which for once simply posts the facts. Feel free to forward this along.